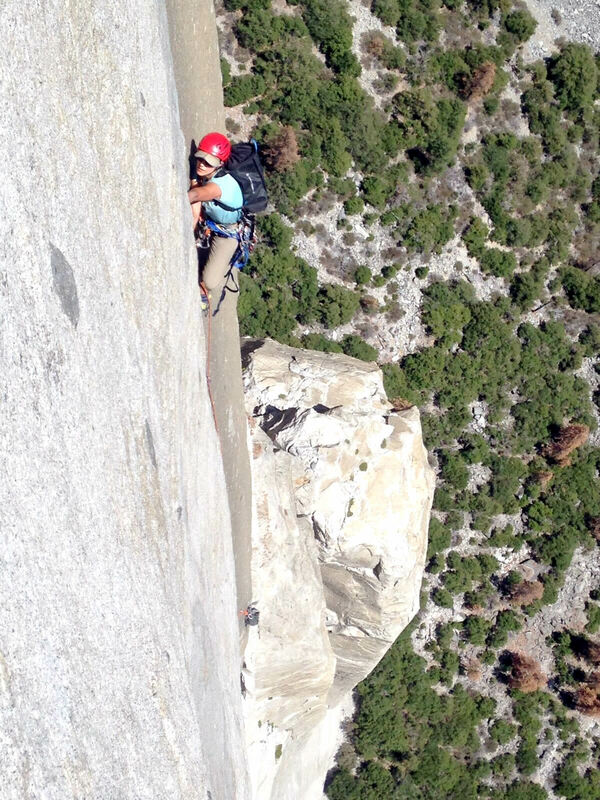 On August 5, Yosemite climbing guide and longtime local Miranda Oakley became the first woman ever to solo El Capitan's Nose in a day (NIAD). She slapped the El Cap tree at 21:50, nearly three hours faster than the previous record (set by Chantel Astorga in 2014), and five hours better than her own previous best. Although Oakley has climbed the Nose an estimated ten times (she can't recall the exact number) over the last six years, this was only her second attempt to solo the route. Her first attempt came last autumn, when she climbed it in about 26 hours. On that day, at the base of the Great Roof, Oakley felt she was too far off pace to finish in less than 24 hours, so she slowed considerably in order to "just enjoy the rest of the climb." When she finally topped out, she realized that she probably would have set the record if she had kept up her initial pace. For her second attempt at the speed record, she prepared by bringing quick-lace approach shoes and Velcro climbing shoes to save time changing footwear between free and aid climbing blocks. Oakley—who has little experience with solo climbing, and tends to avoid free soloing—self-belayed with a Grigri for all except the Texas Flake and the bolt ladders, a method that forced her to rappel and jug almost all thirty-one pitches in order to clean her gear. Chantel Astorga, by comparison, opted to free solo half of the Stovelegs as well as the four pitches from Dolt Tower to the top of the Texas Flake. It wasn't until the final pitch, a casual 5.7 traverse, that Oakley decided to employ the speed-climbing tactic of a PDL to try and save a few minutes. But right before she was able to touch the El Cap tree, the PDL got stuck, and she had to rappel back down to free the rope, thus adding twenty minutes to her total time. Over the phone, Oakley laughed about the irony. Astorga views the first female solo NIAD as "part of a bigger progression" of women's visibility in the climbing world. "Miranda, Jes Meiris... Josie Mckee, [and myself]" she explained via email, noting other women who have made strong bids at the record, "we've all been inspired by each other...and that's really what it's about." Oakley, following her attempt in 2015, suggested that Libby Sauter or Mayan Smith-Gobat could have probably onsighted the solo NIAD if they were interested. But Smith-Gobat explained that she was "far more motivated to put effort into free climbing [the NIAD], or maybe at some point in the future dropping the women's (team) speed record to under 3 hours!" Sauter, meanwhile, mentioned that while she has never pursued the solo NIAD, at times she has felt "it is a right of passage I wish I was motivated to undertake." Astorga, Smith-Gobat, Sauter and Madaleine Sorkin all noted the difficulty of balancing speed and risk assessment on the solo NIAD. The more you free solo, the faster you are able to go (since you do not need to rappel to backclean, and then jug those pitches). This, perhaps, is what most makes Oakley's climb notable: unlike her predecessors, the only pitch that Oakley free soloed was the Texas Flake. 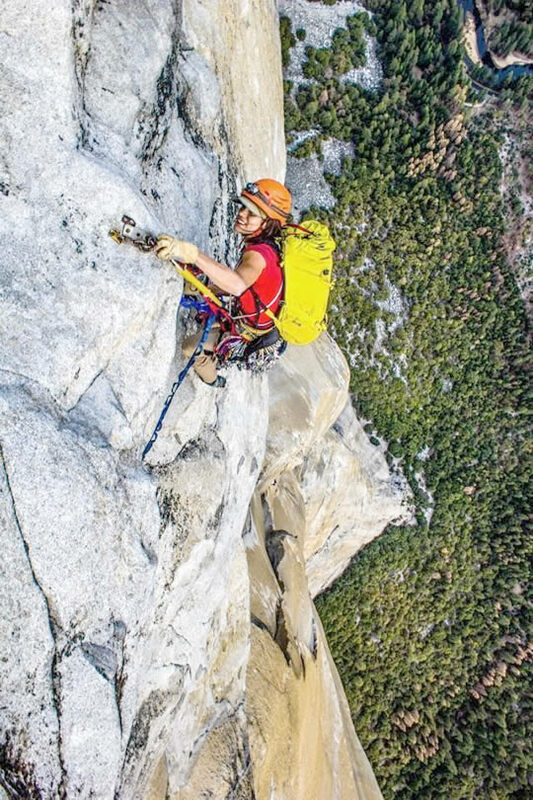 Oakley, in her tenth season living and working in Yosemite Valley, has quietly established herself as one of the best all-around female trad climbers in the United States. Her hard ascents include Zion's Moonlight Buttress (V 5.12+, 9 pitches, 1,200'), Blow Hard (IV 5.12+, 6 pitches, 800') on the Incredible Hulk, and an onsight of Indian Creek's Ruby's Cafe (5.13a/5.12+). She's also made first ascents in Chilean and Argentine Patagonia, as well as Sequoia National Park. Oakley expressed relief to have finished her "summer project," explaining that she had been "kind of obsessed." Now she's looking forward to returning to free climbing, "as soon as the Valley cools off a little." Not only did Oakley smash the women's solo speed record, she also practiced a little bit of stewardship along the way. Any time she finished an abandoned bottle of water, she clipped the bottle to her harness, and kept on going. When she finally topped out, she had two gallon jugs and a liter bottle hanging from her gear loops. These she carried back to the valley floor, and deposited in recycling.